You are holding a most valuable resource; one that can save you a great deal of time and effort. 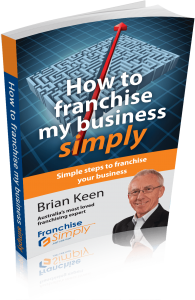 Sandra & I refer to Brian Keen as the ‘Go-to man for franchising’ and he has drawn from his wealth of experience to produce this fine, easy-to-follow book. It will be invaluable to any reader looking to navigate their way to success in franchising. Brian was genuinely excited about helping us to bring our business to franchise stage. We actually felt a great sense of great relief to know he was on our side and had the answers and ideas to get us over the line. The team that Brian uses to help implement his programme are first class. There are Branding, Marketing, Legal, Territory and System experts who work closely with you to get things done (and done right, first time!). The triple digit growth we experienced in 2016 would have left us floundering had we not completed the ‘Franchise Simply’ process and implemented the necessary procedures to cope. You will not find a more knowledgeable, humble, good-humoured and generous person than Brian Keen in the franchise arena. Do yourself a huge favour - read this book and start your own exciting and rewarding journey towards becoming a franchisor. Hats off to you Brian – you’re the man!